Libra Love Horoscope 2017 forecasts an extremely busy year with rising conflicts in matters of the heart. The Libra zodiac sign is basically a social being and hence will be interested in social activities as well as matters of love. In 2017, you may have to reduce your social interactions as you will not have enough time on your hands. You will be preoccupied with other activities and you can use your spare time for community affairs. Only important social events should attract your attention. Libra, presence of Saturn in your House of Relationships in 2017 will produce conflicting situations in your love life. You may have to change your outlook on your expectations from love relationships. Family life will be full of social activities and because of this you will not have enough time for your spouse and family members. The 2017 love forecast warns that you are unable to decide whether you should give importance to family affairs or social engagements in 2017. This might lead to some sort of tension between couples. But if you share good communication with your partner, such minor obstacles will be solved in no time. The 2017 Libra love astrology predicts that singles will focus on a single person and will get married to that person. You are likely to find your lover with the help of your family members or in family gatherings. Parties and conferences are other sources of romance. Your soul mate is likely to be an elderly person who is stable, sober and somewhat unenthusiastic. But the partner for the Libra personality will be well organized and calculative. Your partner will be committed to the family and will be emotionally stable. Months of July, October and December 2017 are ideal for getting into committed relationships. Libra, your marriage with your life partner will happen during the end of the year. 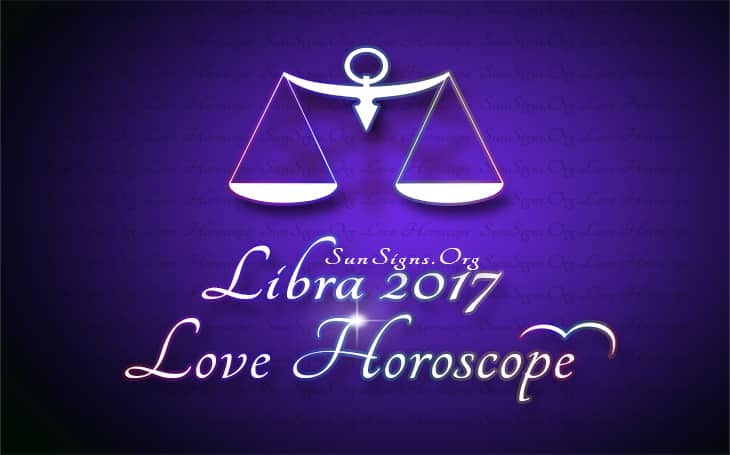 The Libra 2017 love horoscope forecasts that there will be a major change in the life of married couples this year. Your partner will become more dominant and will like to take all the decisions. Your spouse will be highly aggressive and would like to have a say in your professional and worldly objectives. At the same time your partner wants to be independent and will not brook any interference from you in his or her affairs. Libra, love relationship with your spouse will be cold and lot of effort is required to rekindle the fire of romance in your soul mate. Be careful if you are planning to have a baby. Libra natives looking for second or third marriage in 2017 will be presented with ample love opportunities which will provide lot of pleasure and entertainment. Prospects of marriage are however bleak but sexual compatibility will be excellent. The siblings and children of Libra sun sign will share good love compatibility with their partners in 2017. Some obstacles in marriage might be possible. But these can be overcome with patience and diplomacy. Overall, the Libra horoscope 2017 predicts a confusing year for love relationships for people of the Scales zodiac sign.